After witnessing the aftermath of the 1969 Santa Barbara oil spill, former U.S. Senator and Wisconsin native Gaylord Nelson hosted the first Earth Day in 1970. At the time, the Santa Barbara oil spill was the largest oil spill in the United States. Within a 10-day period, an estimated 80,000 to 100,000 barrels of crude oil spilled into the Channel. The spill was a well blowout during drilling from an offshore oil platform located about six miles from the southern California coast. 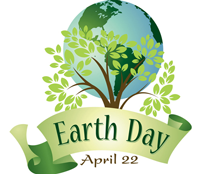 This year’s Earth Day theme is Protecting Our Endangered Species. Today, the planet is facing the greatest rate of extinction since the dinosaurs were lost over 60 million years ago. The rapid reduction of plant and wildlife is linked directly to causes driven by human activity. Below are five things you can do to help ensure our planet maintains the bio-diversity that makes it so special. 1) Recycle and buy sustainable products. Buy recycled paper and sustainable products like bamboo and Forest Stewardship Council wood products to protect forest species. Scientists say the best way to protect endangered species is to protect the special places they live. Bring your own mug, cup, silverware and a plate/bowl to work so you don’t have to rely on disposables. 2) Learn about the endangered species in your community. Teach your friends and family about the wonderful wildlife, birds, fish and plants that live near you. 3) Make your home wildlife friendly. Provide habitat for wildlife by planting native vegetation in your yard. Native plants provide food and shelter for native wildlife. Attracting native insects like bees and butterflies can help pollinate your plants. 4) Avoid use of herbicides and pesticides. Herbicides and pesticides may keep yards looking nice but they are highly hazardous pollutants that affect wildlife at many levels. 5) Report any harassment or shooting of threatened and endangered species. Harassing wildlife is cruel and illegal. If you see something that makes you concerned, reach out to local authorities.